Services: Station Design Feasibility Study, Landscape Enhancement Proposals & Detailed Soft Landscape Plan. In March 2018 The Urbanists were commissioned by Transport for Wales to review the existing plans prepared by the clients engineering team for a new station at Bow Street and identify potential design improvements which would align the work to date with the emerging Placemaking Vision & Principles. The site of the proposed Bow Street station, at the edge of the settlement, is a natural gateway to the village. The transport investment was therefor a major opportunity to enhance Bow street as a whole. It was possible to create a better transport environment which will also enhance the general setting of Bow Street. A further consideration is of the location of the site in a wider rural setting. A typical urban station was not entirely appropriate in this context and a softer approach, with a layering of landscape interventions helped create a greener gateway to Bow Street which sits sympathetically into the wider mid-Wales landscape. Design interventions, alongside some suggestions on street furniture & hard landscape materials establish a potential variant to the proposed scheme. Our soft landscape proposals enhance the frontage of the new train station & provide a welcoming and attractive entrance. An outline specification of the following landscape elements were provided. 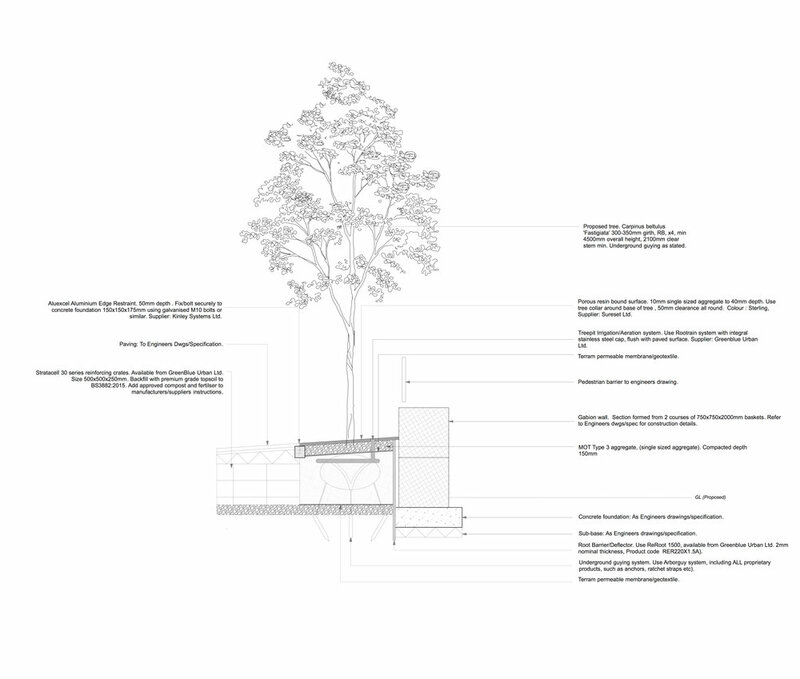 Proposed tree & shrub planting. Amenity grass seeding to the verge areas.